For an Arizona backpacking trip, the Superstition Wilderness encompasses over 159,000 acres of land in the Tonto National Forest east of Phoenix, Arizona. It’s beauty and remoteness makes the area a hiker’s dream – hundreds of miles of trail, perennial water sources and varied elevations, making the area a great 3-season hiking destination. The Superstition Wilderness also carries with it a long history from early Native Americans, Mexican miners, American settlers, gold miners, cattle ranchers, US military and even contemporary hunters for the legendary Lost Dutchman’s Goldmine. You may not stumble upon the hidden riches, but we’ll show you other Sonoran Desert treasures like petroglyphs, ancient ruins, the icon of the southwest – the Saguaro Cactus, wildflowers and the beauty of Mother Nature. 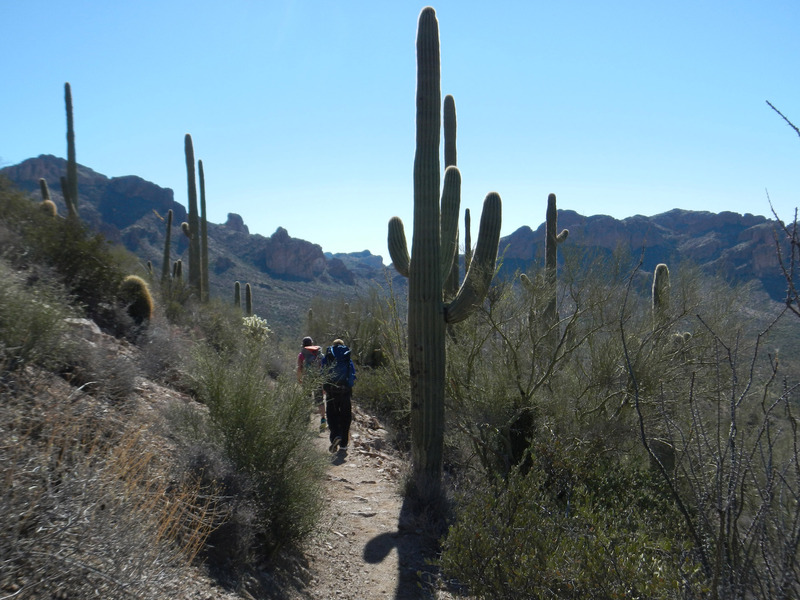 Hiking in the Superstition Wilderness is a great way to see another side of Arizona, explore the vast acreage of wilderness just outside the hustle and bustle of Phoenix. This is where the local outdoors enthusiasts go when we need to get some time in the great outdoors – and we keep going back for more! 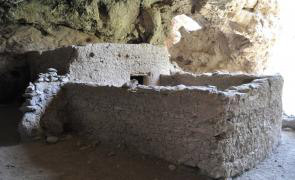 The Reavis Ranch/Roger’s Canyon backpacking trip is ripe with history – ancient and not so ancient. It is a secluded valley in the center of the eastern Superstitions once inhabited by the Salado Indians over 700 years ago and then by Elisha Reavis to establish a farm in 1874. 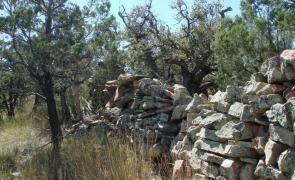 Evidence of both still exist in the area – a 700 year old ruin so well preserved that looks barely 20 years old, evidence of Reavis’ Ranch and an old abandoned apple orchard that still bears fruit. The Reavis Ranch Superstition Mountain trails follow the path of an old road that was used to access the ranch in the mid 20th century, but certain parts look much more like a rocky trail than a road. This Arizona backpacking trip will start you in lower desert terrain to high desert meadows lined by Cottonwood and pine trees. There are a lot of backpacking options in the Superstition Wilderness with hundreds of miles of trails. Plus, hiking in the desert comes with its own set of challenges; remote terrain, availability of water sources and trailhead accessibility. Let us help you narrow down the route with our outfitting services. Your experience will be more enjoyable as we will do the footwork for you. Click here for more information about JRI’s outfitting services. The day begins with a drive through the Superstitions along Queen Valley Road followed by 13 miles (20.9 km) of dirt road before reaching our trailhead deep in the mountains. Our hike takes us downhill from this point into Rogers Canyon, dropping about 1,000 ft in elevation over 4.5 miles (7.2 km). After setting up camp in Angel’s Basin, we will take a short walk back to a cave, which holds some of the best-preserved Native American cliff dwellings in Arizona. After breakfast, we hike up Rogers Canyon along the Frog’s Tank trail. We head up toward Windy Pass and eventually into the Reavis Valley. After setting up camp along the Reavis Creek, the group will explore the remains of the old guest ranch, which once thrived in the valley. There are fences, farm equipment and even an apple orchard still on the property. Total hiking distance for the day is 8.1 miles (13 km). Our camp remains in the Reavis Valley today. After breakfast, we pack up just a day pack for a side hike to the remote Circlestone Ruins. Some experts believe that the stones in this formation are a calendar that was built by Native Americans over 700 years ago. 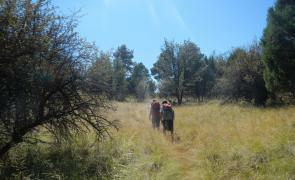 This side hike to the ruins is 5 miles round trip with an 1,160 ft gain in elevation to the site. We hike out of the valley on the opposite end along the Reavis Creek until we reach Reavis Saddle. 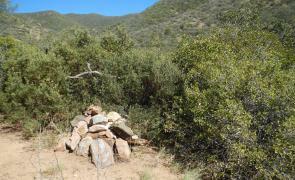 We will hike past the grave of Elisha Reavis before we connect back with the Rogers Canyon trail and reach our trailhead. The hike out of the canyon usually takes about 4.5 hours to cover the 6.5 miles (10.5 km) back to the trailhead. We should be back to the vehicle between noon and 2:00 PM depending on our explore time, bringing us back to Phoenix no later than 5 PM.